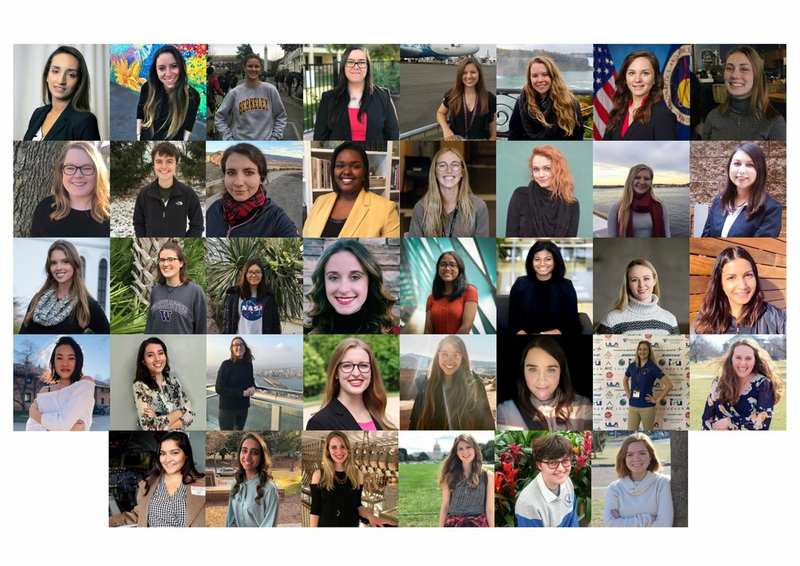 FEBRUARY 5, 2019 – WASHINGTON, DC – Today, the Brooke Owens Fellowship announced its newest class of “Brookies,” a cohort of extraordinary undergraduate women in aerospace selected for their professional aptitude, their creativity, their leadership ability, and their commitment to serving their communities. These 38 young leaders—currently completing their bachelor’s degrees at universities in nineteen states plus the District of Columbia—have been paired with jobs at the nation’s leading aerospace companies and organizations, as well as executive level mentors committed to helping the Fellows achieve their considerable potential. The selection process for the Class of 2019 was the Fellowship’s most competitive yet, with hundreds of applications pouring in from students at more than 125 universities in 13 nations. With the selection of 38 Fellows, the program’s acceptance rate on par with the top universities in the world. The Brooke Owens Fellowship was founded to help transform the aerospace industry by providing opportunities and access to talented young professionals from historically underrepresented genders. The program gets its name from beloved space industry pioneer and accomplished pilot D. Brooke Owens, who passed away at the age of 35 after a hard-fought battle with cancer. The Fellowship was founded by three close friends of Brooke’s: Lori Garver, the former Deputy Administrator of NASA; Cassie Lee, who served as Head of Space Program for Paul G. Allen; and William Pomerantz, the Vice President of Special Projects at Virgin Orbit. Those wishing to learn more or to donate to this non-profit initiative can visit brookeowensfellowship.org. Khadija Abousalama, a Senior majoring in Mechanical and Aerospace Engineering at the George Washington University. Originally from Salé, Morocco. Ms. Abousalama will work at Northrop Grumman Innovation Systems in Dulles, VA.
Iris “Kira” Altman, a 5th Year Senior majoring in Aerospace Engineering at the University of Colorado Boulder. Originally from Colorado Springs, CO. Ms. Altman will work at Ball Aerospace in Boulder, CO.
Franziska “Franee” Barthel, a Junior majoring in Mechanical Engineering at the University of California, Berkeley. Originally from Koenigstein im Taunus, Germany and Santa Barbara, CA. Ms. Barthel will work at Virgin Orbit in Long Beach, CA. Angelica Berner, who recently graduated with a degree in Physics from Arizona State University. Originally from Chicago, IL. Ms. Berner will work at DigitalGlobe in Westminster, CO.
Sydney Bihn, a Junior majoring in Aerospace Engineering at Kent State University. Originally from Sylvania, Ohio. Ms. Bihn will work at Kitty Hawk Corp. in Mountain View, CA. Ashleigh Bunch, a Junior majoring in Aerospace Engineering at Georgia Tech. Originally from Suwanee, GA. Ms. Bunch will work at Amazon Prime Air in Seattle, WA. Dallas Capozza, a Junior majoring in Aerospace Engineering at the University of Colorado Boulder. Originally from Niantic, CT. Ms. Capozza will work at Virgin Galactic in Mojave, CA. Ivy Christensen, a Senior majoring in Mechanical Engineering at Syracuse University. Originally from Thompson, PA. Ms. Christensen will work at Sierra Nevada Corp. in Louisville, CO.
Shelby Conry, a Sophomore majoring in Aerospace Engineering at Iowa State University. Originally from Griswold, IA. Ms. Conry will work at the Mojave Air and Space Port in Mojave, CA. Alyssa Crystal, a Junior majoring in Aeronautical Science at Embry-Riddle Aeronautical University. Originally from Syracuse, NY. Ms. Crystal will work at the Air Line Pilots Association in Herndon, VA.
Vera Demchenko, a Senior majoring in Astrophysics at the University of Colorado Boulder. Originally from Dzhankoy, Ukraine. Ms. Demchenko will work at NASA’s Goddard Space Flight Center in Greenbelt, MD. Mykaela Dunn, a Senior majoring in Aerospace Engineering at the University of Texas at Austin. Originally from Houston, TX. Ms. Dunn will work at Stealth Space Company in Alameda, CA. Makena Fetzer, a Junior majoring in Astrophysics at the University of California, Berkeley. Originally from Tucson, AZ. Ms. Fetzer will work at Spire Global in San Francisco, CA. Jenna Kay Foertsch, a Senior majoring in Business and Marketing Education at the University of Minnesota, Twin Cities. Originally from Burnsville, MN. Ms. Foertsch will work at XPRIZE in Culver City, CA. Julia Gaubatz, a Sophomore majoring in Aerospace Engineering at MIT. Originally from Colorado Springs, CO. Ms. Gaubatz will work at Blue Origin in Kent, WA. Sarah Gomez, a Senior majoring in Mechanical Engineering at San Diego State University. Originally from Tijuana, Mexico. Ms. Gomez will work at The Spaceship Company in Mojave, CA. Grace Graham, a Junior majoring in Aeropace Engineering at Utah State University. Originally from St. George, UT. Ms. Graham will work at the Aerospace Corporation in El Segundo, CA. Grace “Cat” Hannahs, a Sophomore majoring in Aeronautics and Astronautics Engineering at the University of Washington. Originally from Atlanta, GA and Spokane, WA. Ms. Hannahs will work at SpaceX in Hawthorne, CA. Amy Huynh, a Sophomore majoring in Mechanical and Aerospace Engineering at the University of California, Irvine. Originally from Irvine, CA. Ms. Huynh will work at Made in Space in Moffett Field, CA. Kaley Hassell, a Junior majoring in Aerospace Engineering at the University of Oklahoma. Originally from Prairie Grove, AR. Ms. Hassell will work at Sierra Nevada Corp. in Louisville, CO.
Anika Hidayat, a Junior majoring in Mechanical Engineering at the University of Washington. Originally from Vancouver, WA. Ms. Hidayat will work at Northrop Grumman Innovation Systems in Dulles, VA.
Khristian Jones, a Junior majoring in Aerospace Engineering at Wichita State University. Originally from Plainfield, IL. Ms. Jones will work at the Mojave Air and Space Port in Mojave, CA. Elena Kamis, a Junior majoring in Aerospace Engineering at the University of Illinois at Urbana Champaign. Originally from Orchard Park, NY. Ms. Kamis will work at HawkEye 360 in Herndon, VA.
Supreet “Sue” Kaur, a Senior majoring in Industrial and Systems Engineering at San Jose State University. Originally from Punjab, India. Ms. Kaur will work at the Center for Strategic and International Studies in Washington, DC. Shu-Yu “Michelle” Lin, a Sophomore majoring in Aerospace Engineering Sciences, Applied Mathematics, and Engineering Physics at the University of Colorado Boulder. Originally from Keelung, Taiwan. Ms. Lin will work at SpaceX in Hawthorne, CA. Bridget McDonough, a Senior majoring in Aerospace Engineering at Syracuse University. Originally from Whittier, CA. Ms. McDonough will work at Space Angels in New York, NY. Maureen McNamara, a Junior majoring in Integrative Physiology at the University of Colorado Boulder. Originally from Denver, CO. Ms. McNamara will work at Avascent in Washington, DC. Katherine “Katie” Melbourne, a first-semester Senior majoring in Astrophysics at Yale University. Originally from Bettendorf, Iowa. Ms. Melbourne will work at Ball Aerospace in Arlington, VA.
Hannah Munguia, a 5th Year Senior majoring in Environmental Engineering and Earth Science at the University of California, San Diego and at the Scripps Institute of Oceanography. Originally from Chula Vista, California. Ms. Munguia will work for Planet in San Francisco, CA. Marissa Navarro, a Junior majoring in Electrical and Computer Engineering at Rutgers University. Originally from Torreón, Mexico. Ms. Navarro will work at HawkEye 360 in Herndon, VA.
Leah Nolan, a Junior majoring in Aerospace and Mechanical Engineering at the University at Buffalo. Originally from Elma, NY. Ms. Nolan will work at Rocket Lab in Huntington Beach, CA. Natalie Pfister, a Junior majoring in Aerospace Engineering at the University of Illinois at Urbana Champaign. Originally from Rolling Meadows, IL. Ms. Pfister will work at Generation Orbit in Atlanta, GA.
Rukmini "Rikhi" Roy, a Junior majoring in Aerospace Engineering at Georgia Tech. Originally from Singapore. Ms. Roy will work at Bryce Space and Technology in Alexandria, VA.
Saumya Sharma, a Sophomore majoring in Aerospace Engineering at Georgia Tech. Originally from South Brunswick, NJ. Ms. Sharma will work at Astranis Space Technologies in San Francisco, CA. Jamie Weisenberg, a Junior majoring in Astrophysics and Earth and Planetary Sciences at Harvard University. Originally from Boston, MA. Ms. Weisenberg will work at Avascent in Washington, DC. Kaitlyn “Katie” Welch, a Senior majoring in Aerospace Engineering at Rutgers University. Originally from Glen Gardner, NJ. Ms. Welch will work at Astranis Space Technologies in San Francisco, CA. Jaclyn Wiley, a Senior majoring in Spaceflight Operations at Embry-Riddle Aeronautical University. Originally from Venice, FL. Ms. Wiley will work at Bryce Space and Technology in Alexandria, VA.
Lindsey Wiser, a Junior majoring in Engineering Mechanics and Earth and Planetary Science at Johns Hopkins University. Originally from Albany, CA. Ms. Wiser will work at the Smithsonian National Air and Space Museum in Washington, DC.